The steady rain beat against the mud walls. Drops of rainwater seeped through the battered roof onto the dirt floor, quickly forming puddles between the men and women crowded below. Plastic tarps, draped over the hut to protect it from the elements, flapped violently in the wind. Clouds grew large and dark above the little mud house. But the joy of the people who gathered inside the house could outshine any storm. The people in the village weren’t interested in what GFA World pastor Rwiju had to say when he first began to minister in the area. Day after day, Rwiju talked to the villagers about the great love of God, but no one listened. Rwiju had decided to stay his course and obey what God called him to do, even if no one seemed to care. Pastor Rwiju befriended a nominal Christian man named James and shared the love of Christ with him. Because of Rwiju’s kindness, James opened up to him and decided to trust in Jesus. Soon others came to know Jesus’ love as well. Eventually, the pastor crossed paths with a man named James. Rwiju found that James called himself a Christian but didn’t know what it meant to have a relationship with Jesus. After a few exchanges of friendly conversation, James realized he had found a confidant in Pastor Rwiju. James told the pastor with a heavy heart about his family and the many problems they faced. He asked Rwiju to pray for the Lord’s intervention. From that point on, Rwiju met regularly with James’ family in their home to pray with them. As God answered their prayers and established peace in James’ household, the whole family decided to embrace Christ. The little fellowship grew during the next six months as more people gathered to pray and read the Word. But there was a problem: The house they met in was made of mud. It was small, poorly lit and didn’t have proper ventilation. Nevertheless, the believers gladly crowded in and worshiped God in spirit and truth. After a few months, Rwiju and the believers joyfully worked together to build a larger mud hut to meet in. Though the obstacle of size was eliminated by the construction of the new building, another problem soon took its place: the weather. Monsoon rains and winds took their toll on the mud church, even after the believers added plastic tarps to protect the mud walls from wind and rain. The constant dripping of rainwater made the floors of the building a muddy mess, and the walls threatened to collapse with every new storm. The believers crowded into a small mud hut. After a few months, Pastor Rwiju and the believers constructed a larger mud building to accommodate their numbers. Even though the larger mud hut gave them more room, it did not provide shelter during monsoon season. To make matters worse, people in the community mocked Pastor Rwiju and the believers at the sight of their hut’s poor condition. “What difference are you people going to make?” they asked. Pastor Rwiju and the believers realized they needed a sturdier building—one that could withstand heavy storms during the rainy season. They persistently asked God to provide them with a permanent place to gather together. Then, after eight long years, He answered their plea with a church made of bricks. The believers no longer needed to worry about staying safe and dry as they worshiped, even in the strongest storms. When the new, sturdily constructed church building was finished, the Sunday school, Women’s Fellowship meetings and church body as a whole grew stronger. The building provided a secure place to worship and a place to learn together about the Lord. The church body also experienced additional growth in the fellowship’s numbers. The villagers no longer mocked the believers’ place of worship. Instead, they became curious about the prayer meetings and Sunday services that were held inside. One of these curious people was a woman named Poorvi. After suffering from her husband’s drinking habits for nearly a decade, Poorvi made the difficult decision to take their 9-year-old son and 2-year-old daughter and leave their home. She hoped to find relief and provide a better life for her children. Instead, she found only unrest and discontentment. Poorvi’s heart grew heavy; she felt as if the world was crumbling down on top of her. Her mind often turned to the prayer meetings at the new church building, and soon she decided to attend. The power of God’s Word greatly soothed Poorvi’s heart when she went to the church for the first time. She began attending regularly and asked Jesus to forgive her sin. 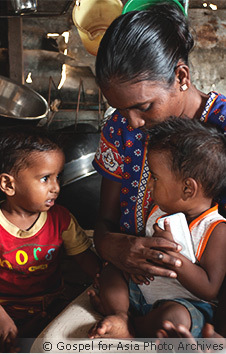 Poorvi responded to the Lord’s work in her life and made her faith known to others. After eight years of prayer, God provided a sturdy church building for Rwiju and the other believers. Seeing this, many villagers became curious about Christ. One of these people was a woman named Poorvi, who left her drunken husband to find relief and provide a better life for her children. Like Poorvi, many other villagers have found peace inside this church building. Men, women and even children often come from near and far to see the sturdy brick structure. The curious often attend worship services and find great relief for their hearts. Pastor Rwiju and his fellow believers are thankful they don’t have to gather in the mud any longer. Now they can sit in a clean, dry environment together as they worship and thank the Lord for His faithful answers to prayer. As they grow in their love for the Lord, others in the village are also coming to know and love the God who provides. After the church building was constructed, many people came to know the Lord in Rwiju’s village. A church building provides shelter from storms, relief from the scorching sun and opportunities for growth. 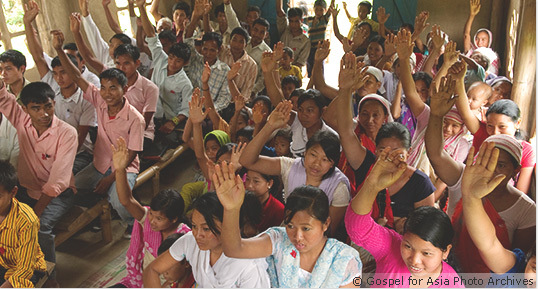 Like Pastor Rwiju’s congregation, believers all over South Asia are praying for church buildings. You can be part of the answer to their prayers. 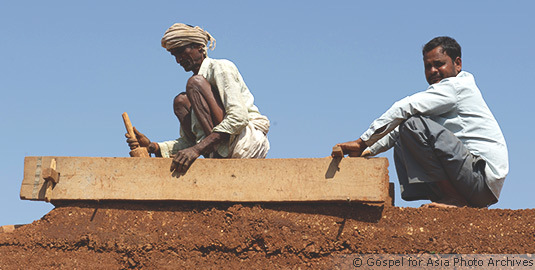 The average cost to build a church in South Asia is $10,000 - $40,000.